Shika is a desktop bookshelf. 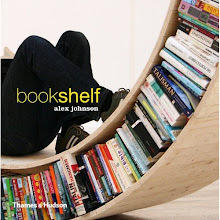 It can hold about five books and uses the weight of the books to maintain stability. 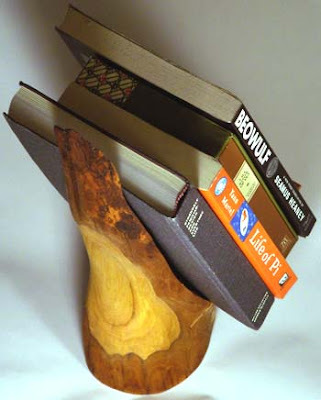 The design grew from my desire to make a rustic desktop bookshelf from natural materials, informed by modern patterns of use. 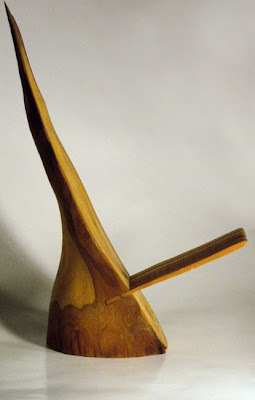 The backbone is carved from a single branch, the shelf made from four different woods laminated together.Shika means: Deer (Japanese) Money/ Gold (Ga) Drunkard (Yiddish). This is a lovely looking piece and would be ideal for the pile of books on my bedside table.